-- February 16: Pittsburgh. Tree Pittsburgh Campus, Upper Lawrenceville. 9:00 a.m. to 4:00 p.m. Click Here for more. -- March 19, 26 and April 2: Bucks County. Click Here for more. -- May 6, 13, 20: Philadelphia. Click Here for more. -- May 16, 23, 30: Chester County. Click Here for more. -- September 18, 25, October 2: Delaware County. Click Here for more. -- September 18, 25, October 2: Philadelphia. Click Here for more. -- Advanced Tree Tenders Webinar Series. Click Here for more. Tree Tenders® is a training program that empowers concerned residents to make dramatic strides towards restoring and caring for the tree canopy in their communities. The course is designed for lay people and experts alike. 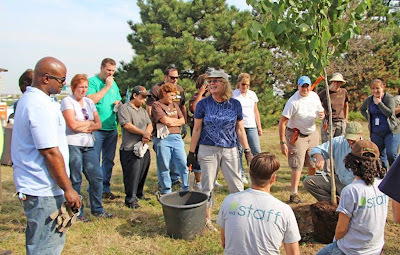 Tree Tenders training includes: Tree Biology; Urban Stresses on Trees; Tree Identification; Tree Pruning and Root Care; Tree Planting Techniques; and Community Organizing. For more information on these and other similar community tree programs, visit DCNR’s TreeVitalize webpage.